Ferrari's Fernando Alonso feels he could have "easily" taken pole position for the Italian Grand Prix had he not suffered a mechanical failure in the final part of qualifying. Alonso is confident his car will be fixed for Sunday's race but admits it is going to be difficult starting from 10th. 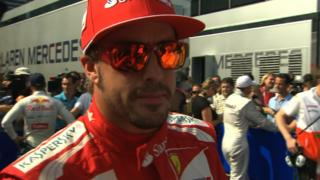 Team-mate Felipe Massa declares himself "very happy" to have qualified third and is hopeful of a good race at Monza.